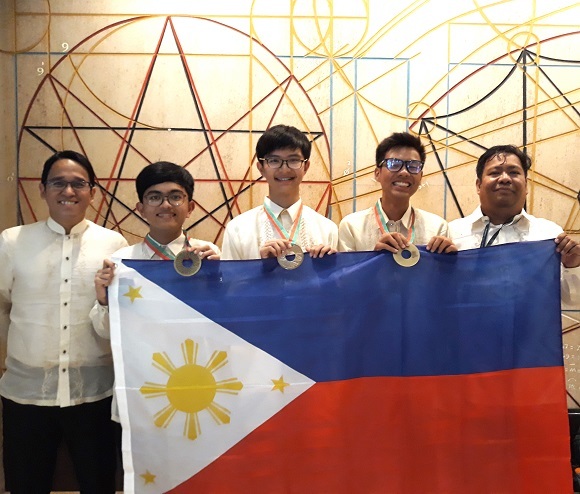 Filipino students won medals at the recently held 49th International Physics Olympiad (IPhO) in Lisbon Portugal. This was by far the best performance of any Philippine time in the annual IPhO. A silver medal was won by Steven Reyes from St. Jude Catholic School (SJCS), Mikhail Torio of Philippine Science High School - Main Campus (PSHS-Main) and Charles Bartolo from Science High School-Central Luzon Campus (PSHS-CLC) was awarded a bronze medal each. The team placed 34th from a field of 87 delegations in the IPhO. They were congratulated by Dr. Josette Biyo, Director of the Department of Science and Technology-Science Education Institute (DOST-SEI). “The triumph of our IPhO Team is nothing short of remarkable. Our latest S&T HRD Stat Updates reveal that the number of physicists in the country decreased significantly, yet technological advances are fueled by physics-based researches. We hope they will continue their interest in the field and soon pursue a career in physics. I cannot emphasize enough the need for skilled physicists and their innovative application of physics to enable our economy to move forward swiftly,” said Biyo. The IPhO is an annual competition among teams from secondary schools from around the world. They would compete against each other in a set of individual theoretical and laboratory physics exams. The problems this year involved the detection of gravitational waves, the ATLAS instrument at the Large Hadron Collider, and the physics of blood flow and tumor growth. As for the theoretical exam it consisted of paper transistors and the experimental exam involved the viscoelastic properties of a polymer thread. The Philippine team plans to send another delegation to the 2019 IPhO, which will be held in Tel Aviv, Israel.